This was the first burger I made or ate in several years (I was a strict pescetarian- meaning I ate absolutely no land animals- for three years). It did not disappoint. Oh man. Burger. I ate a freakin' burger and I loved it. Granted, it had squash and apples on it, so of course I loved it. You got you're crisp and your meaty, your tart and your cheesy, your sweet and your savory, your hot and your cold all in one "sandwich!" Bottom line: this is awesome. And adorable. Trust me. Just make it. Mix mushroom, onion, ginger, garlic, salt and pepper into ground turkey. Separate into two patties. Place butternut slices on a lightly greased baking sheet. Bake in a 400 degree oven for 15-20 minutes or until tender. Turn the broiler on high for the last 2 or 3 minutes of baking to brown the butternut slightly. Slice the thickest part of the apple into four thin discs, removing the center of each disc (the core and seeds) with a knife or mellon baller. Grill turkey patties on a greased grill for 4 or 5 minutes on each side or until the center has a temperature of about 165 degrees. 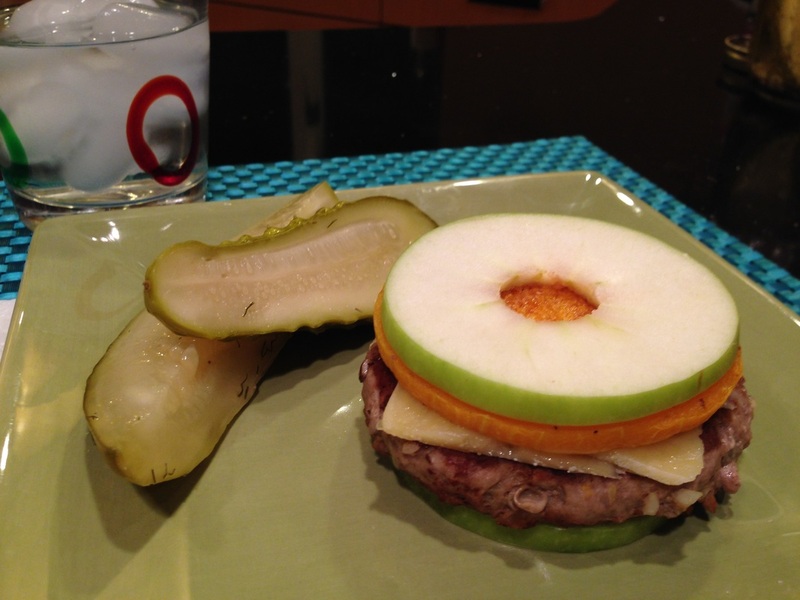 Use apple slices as the bottom and top bun for each burger. Layer cheese between the burger and squash slices so it can melt. Serve with homemade Refrigerator Pickles!